The 13th annual Rogers Santa Claus Parade will hit the streets of Downtown Vancouver on Sunday, December 4, 2016 at 12:00pm in support of the Greater Vancouver Food Bank Society. This festive event, including many local organizations and businesses, is the largest Christmas parade celebrated in Western Canada and is considered a kick-off to the holiday season. 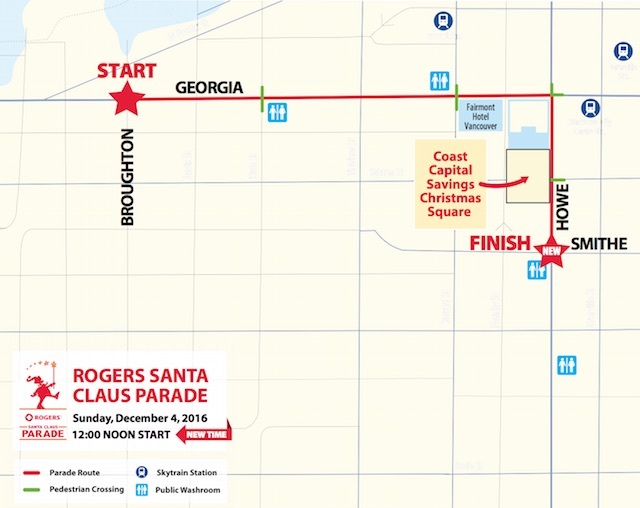 Starting out at 12:00pm, the parade will begin at West Georgia Street and Broughton, travel east along West Georgia, turn south on Howe and finish at Howe and Davie. Over 300,000 spectators flock to this event each year so be sure to arrive early to stake out your viewing spot. A very special part of the Rogers Santa Claus Parade is celebrating the “Spirit of Giving.” Each year, on parade day, volunteers collect non-perishable food items and monetary donations on behalf of the Greater Vancouver Food Bank Society. For every $1 donated, the Food Bank can purchase $3 worth of food. You can also enjoy many activities around the Coast Capital Savings Christmas Square, in the 800 block of Robson (Robson Square), that will be open form 10:00am to 12:00pm. The square will have a gingerbread decorating station, face painting, letters to Santa station, and an entertainment stage featuring exciting music and dancing performances. That is where you can also drop off your donations to the Greater Vancouver Food Bank Society. Follow the parade on Facebook and Twitter with #RogersSantaClausParade for the latest updates.